Donald R. F. Harleman, a renowned civil engineer whose love for the ocean and expertise in water quality and waste treatment benefited urban harbors throughout the world, died of cancer on Sept. 28 on Nantucket, Mass. He was 82. A memorial service for Harleman will be held at the MIT Chapel on Nov. 5 at 1 p.m.
Harleman was an engineer, scientist and educator, recognized nationally and internationally, whose research and innovations were directed toward improving water quality and making wastewater treatment available and affordable to all. He was a global leader in advancing the case for technologies like chemically enhanced primary treatment (CEPT) as an alternative to expensive biologically based systems commonly used in the United States. Harleman advocated strongly for implementing CEPT technology as part of the Boston Harbor cleanup. Although it was not adopted in Boston, CEPT became the wastewater treatment technology of choice in a number of developing countries, thanks to his efforts. Harleman, a native of Palmerton, Pa., was a longtime resident of Nantucket and Lexington, Mass. A specialist in hydraulics, he came to MIT in 1950, serving as Ford Professor of Environmental Engineering from 1975 to 1990. 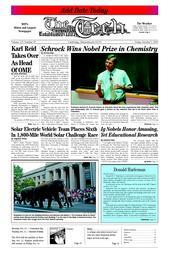 He retired as Ford Professor emeritus in 1991. A devoted teacher, Harleman supervised more than 50 graduate students and championed women in engineering; at the same time, he brought his expertise and enthusiasm to the next generation through leadership at the Institute. He served as head of the Water Resources and Environmental Engineering Division from 1972 to 1983 and as director of the Ralph Parsons Laboratory from 1973 to 1983. Under Harleman’s leadership, the Parsons Laboratory evolved from a premier center of hydraulic research to global leadership on water resources and the water environment. Students from all over the world benefited from the mentorship of Harleman and his wife, Martha. His legacy continues: The Parsons Laboratory remains in the forefront of research and education in the water environment. Harleman served on advisory boards for the cleanup of Boston Harbor and Massachusetts Bay, Chesapeake Bay in Maryland, and Honolulu and Hong Kong harbors. Outside the United States, Harleman worked with advisory groups in Australia, Brazil, China, India and Mexico and the developing world to manage or clean up effluent from megacities. Since 1995, he had been an advisor to the Italian government agency, Consorzio Venezia Nuova, charged with protecting Venice against storm tide flooding. According to his son Robert, Harleman’s two favorite places were Venice and Nantucket. His love of open water extended to a love of sailing. He was a man of many passions, including opera, gardening, Italian food and good political discussions. Above all, he loved his wife, his children and his grandchildren, his son said. Harleman married the former Martha Havens in 1950. He received the BS degree from Pennsylvania State University in 1943 and the SM and ScD degrees from MIT in 1947 and 1950, respectively. He was a member of the National Academy of Engineering and an honorary member of the Boston and American Societies of Civil Engineers. In 2000, MIT established the Donald and Martha Harleman Professorship to support a faculty member whose service within and outside the Institute extends the example set by the Harlemans. Harleman is survived by his wife; a son, Robert I.H. Harleman of Wilton, Conn; two daughters, Kathleen T. Harleman of Champaign, Ill., and Anne Harleman Krieger of New Canaan, Conn.; and six grandchildren. In lieu of flowers, the family has asked that donations be made to the Nantucket Hospice Care Center and Nantucket Hospital (Home Care Department).